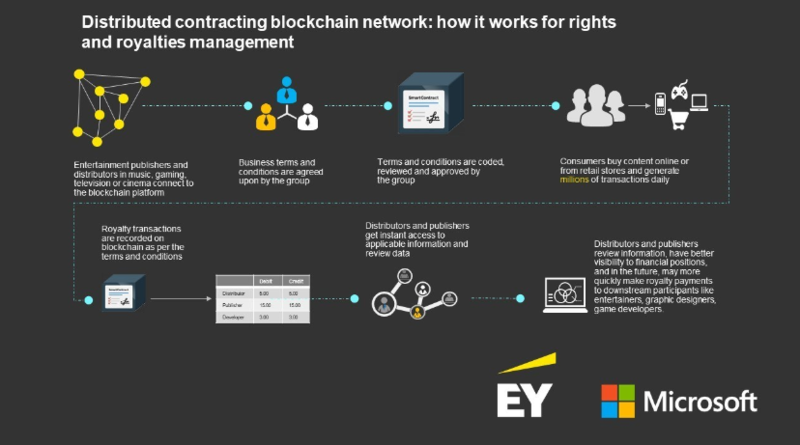 Microsoft and Ernest & Young (EY) launched a blockchain project for content rights and royalties management yesterday, on the 20th of June. The blockchain solution will be first utilized for Microsoft’s game publisher partner, and Ubisoft will be one of the first companies testing the new technology. It will be built employing the Quorum protocol and Microsoft’s Azure cloud and blockchain infrastructures. If the pilot proves successful, Microsoft and EY will use the solution for licensing of intellectual property and assets throughout the industry in hopes to streamline the royalty payments. Currently, complex industry verticals create a difficult environment for tracking rightful copyright holders, but blockchain technology might provide an efficient solution to the problem. On the proposed blockchain platform, publishers and distributing partners would sign business terms and conditions on a smart contract. Thus when consumers purchase content, transactions will automatically be recorded and trigger the appropriate cascade of payments through the smart contract when the relevant data is provided. If the solution is able to penetrate the market, it would connect all the players in the industry, including the entertainers, graphic designers, and game developers, allowing everyone to receive proper credit for their work. EY predicts that the blockchain network could be one of the world’s largest enterprise blockchain ecosystems, eventually processing millions of transactions per day. Despite the ambitious announcement, there remains much ambiguity concerning the project. Not a lot of detail has been shared, and the advantages of blockchain technology are not obvious. Only time will tell if Microsoft and EY will be successful in implementing their blockchain technology.